The girls in my classes can make anything they chose. 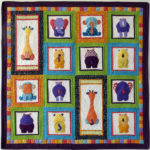 It could be one of my quilts, their own design or a pattern they’ve purchased. This was the case with Eileen’s quilt. A few years ago Eileen fell in love with a quilt that she’d seen at a quilt show and she asked me to help her make it in class. 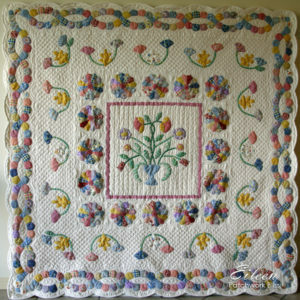 The quilt was ‘Chelsea’ by Sue Daley. 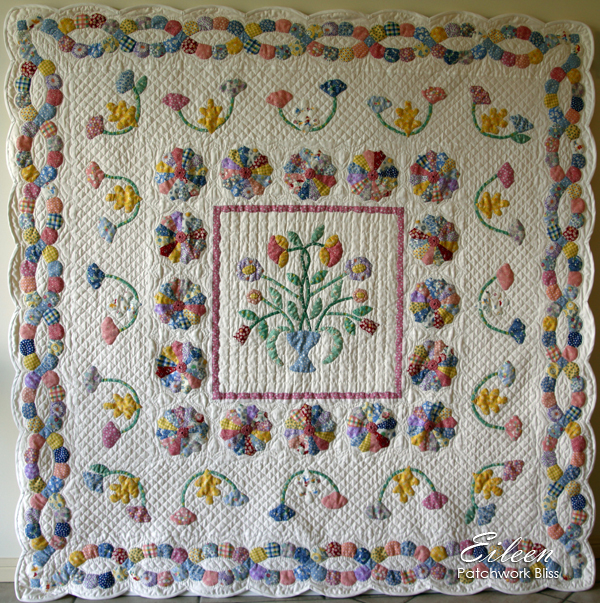 The pattern was purchased and Eileen started making the quilt with 1930 reproduction prints with an antique-white background fabric. 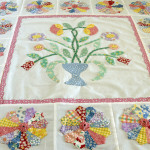 The centre and second-border fabric pieces were traced, cut and basted over freezer paper before being appliqued. 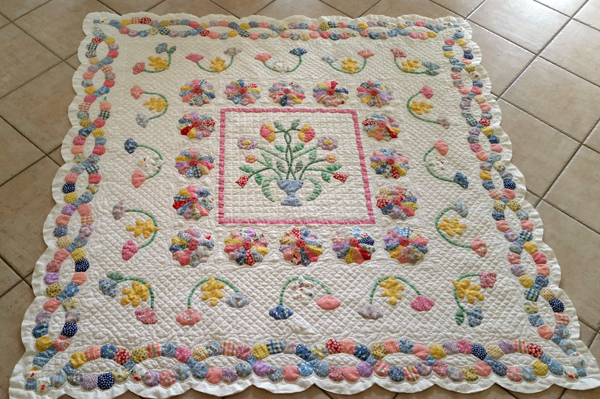 The pieces in the Dresden Plate border and final border were made using the English Paper Piecing (EPP) method of basting the fabric over the papers that were included in the pattern. These pieces were whip-stitched together then appliqued onto the background. 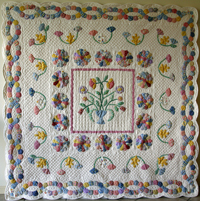 Month after month Eileen cut, basted and hand stitched her beautiful quilt. Gradually it came together and the quilt top was finished in September 2015. At this stage we discussed the quilting. We both agreed that after all the hand stitching it would be great if the quilt was hand quilted. As Eileen wasn’t in a position to quilt it at this time, we came to an agreement for me to baste, quilt and bind Eileen’s quilt for her. It wasn’t until the the second week of October that I was able to get the quilt basted. 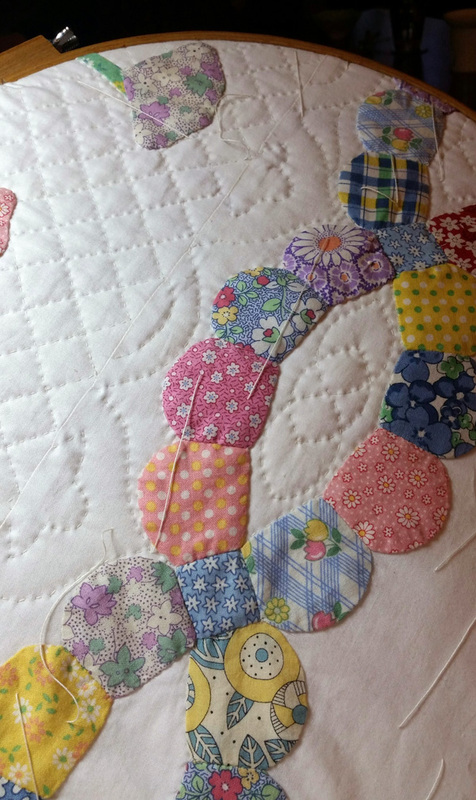 At this stage I started thinking about the quilting design and decided to enhance the applique by stitching around each piece. This had the effect of making the applique pop. I also decided to keep the quilting simple and subtle. Preparation for the quilting started with trepidation as I used a pencil to mark the half-inch cross-hatching, but I needn’t have worried because the lines worked perfectly. The added bonus of quilting such large expanses of background meant there were very few seams to get in the way of the quilting. This made it a joy to quilt. Once the quilting was finished I used a dinner plate as a template to mark the scallop edge. I then made a bias binding that I machine stitched around the scallops. It took a couple of blissful evenings of hand stitching the binding into position. 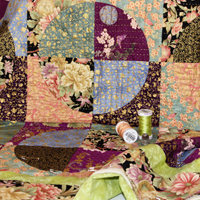 As I stitched, the quilt was draping like silk in my lap. 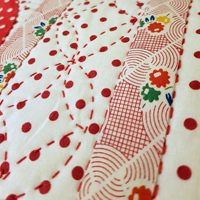 This exquisite softness is another reason to love hand quilting. During last Saturday’s class Eileen came to collect her quilt. Unsurprisingly, it was an emotional moment for both of us when she saw her finished quilt. 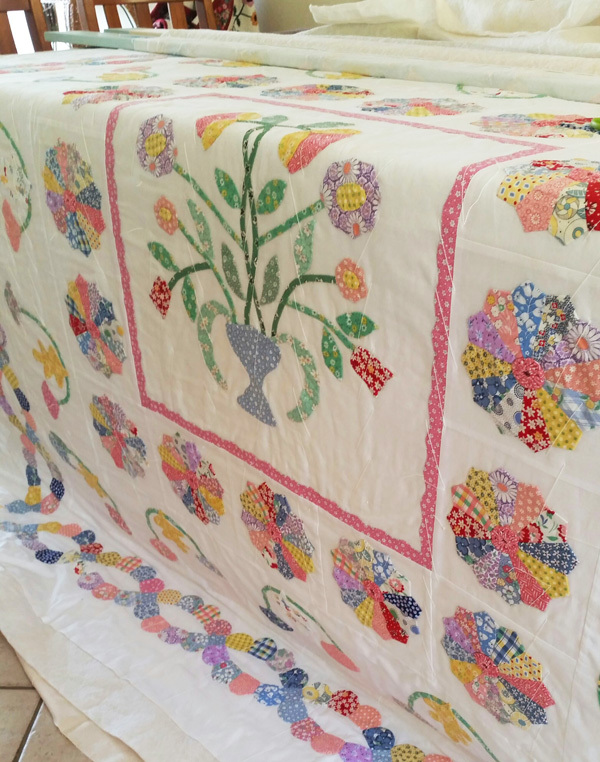 This quilt came to life because of Eileen’s vision, skill and determination to see it though. Being able to help her through the process and then having the honour of quilting such a beautiful quilt is very special to me. This is the joy of what I do. 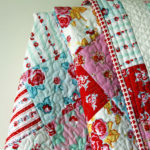 It is indeed Patchwork Bliss.